Wonderful news, Michael. This is the big moment we have all been waiting for. All your hard work and erudition will be much applauded by an appreciative audience. Congratulations, indeed. Wishing great success with this! Congratulations! I recently happened to get an Amazon gift certificate, just in time to use it to order your book, I’m looking forward to reading it. Arrived here via Zite. I’m unfamiliar with you but wow what a worthy topic. Congrats and I look forward to a Kindle edition of your book. As an educator and technologist it’s right up my alley. My 10-year old is competitively folding proteins on Fold.it of all things and we’re increasingly experiencing similar educational-science project wonders. Good job! This is spectacular and I can’t wait to read the book. And, I have a data point showing open science working and how quickly it speeds up progress. Steve Koch and I have several of my experimental movies on YouTube. A few months after submitting them to YouTube, we received emails from two different research groups around the world thanking us for making the data freely available. Both groups are working with the raw data and are investigating things that Steve and I would never have imagined possible when I was taking it. One group published an article in the ArXiv (using some data as confirmation of their theoretical framework) only 2 months after finding our movies. Open science definitely speeds up progress seeing that it took me an entire year to learn how to take decent SNR data. Can’t wait to get my copy. Congratulations Michael! This is great, congratulations, Michael! Looking forward to reading it. Congratulations Michael! I have placed my order with the family giftmeister (that person being, my wife) & am very eager to read it! By the way, Timo Hannay wrote a highly laudatory review for the October 2011 Nature Physics. Excellently done, and congratulations again! 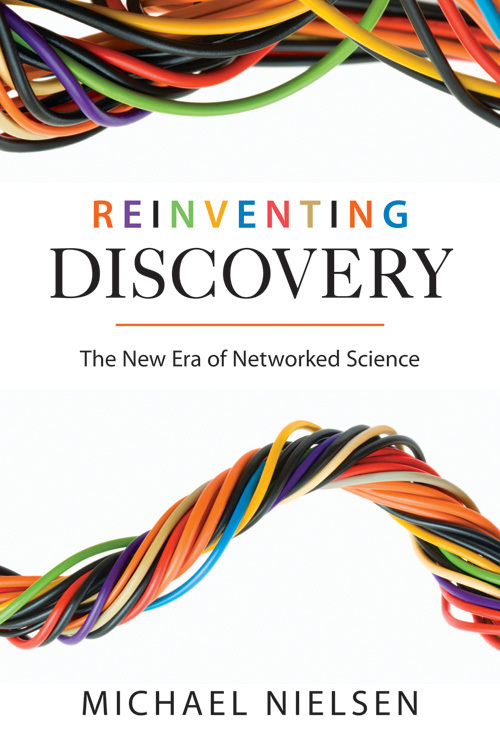 I’ve read the first chapter, and the review on Nature’s website, and watched a video of you talking about reinventing discovery. Just pre-ordered the Kindle edition, and looking forward to reading more. Thanks for sharing your thoughts, Michael! Huge congratulations! I’ve pre-ordered the Kindle version, I’m really looking forward to reading your insights. Thanks, Jonathan and Alessandro! Alessandro, in regard to your comment: the explanation here is that Princeton University Press and Princeton are separate institutions. My understanding is that the Press has agreed in the past to CC licenses on certain specialty items, but they weren’t willing to do it on something aimed at a broader market. Congratulations Michael, great news and as you say (or quote) – “The praise of the praiseworthy is above all reward”. It’s understandable that the publisher wouldn’t accept a CC licence – but then what value did they add? Did you consider other publishers or self publication – you seem to have a fair following already – was it a viable option? And did you try for a shorter copyright licence? I mean you’d expect most of the money to be made the first year or so. Looking forward to reading this. Big fan of your pioneering research on QC. Yes! Thank you! Open science is a concept I’ve been obsessing over for some time. I’m glad there are other like minds out there. I’m glad we can start a movement in that direction. Congratulations on the book, I will certainly be ordering a copy. Shame about the licensing, I hope you are able to come to an agreement once it has been out for a while. It is great to see the open science movement gathering momentum, I am a proud member of this movement. Thanks for all of your hard work, I hope to see things change for the better, and getting this into mainstream books and press is very important for us all. Great news, Michael, my congrats! „Anyone in the world“: Who is s/he? Where and how is s/he situated? 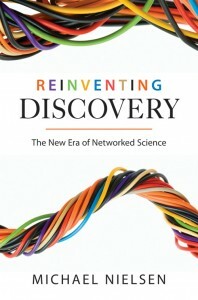 In the first Chapter of his book Reinventing Discovery (starts shipping 21 Oct 2011), Michael Nielsen argues that the impact of „the new online tools“ is indeed „broad-ranging“ and that „many scientists have missed or underestimated“ this, „being so focused on their own specialty“ that in their lack of appreciation these scientists are „like surfers at the beach who are so intent on watching the waves crash and recede that they’re missing the rise of the tide.“ So Nielsen, it seems to me, sets out in this book to describe, and maybe analyze, the location (beach), the surfing (sport), what drives the waves (rules? ), and what in this setting is the tide’s function (broad-ranging change?). Possibly, Nielsen will also address the climate issues at this beach (the weather, the ground and the background scenery, and is there any waste lying around? ), and maybe he will also pose questions like: Who are these people (intent on wind surfing or wave riding)? Are they a group? Why can they afford being at this beach in the first place? What is their equipment like, who was it produced by and at what income level, where do these „tools“ come from and how did they get to this beach? „Anyone in the world may freely download the genetic map“, Nielsen says in his description of how GenBank services are meant to work. With view to the „anyone“ issue in particular, I seek to find out how Michael Nielsen, in the course of the book, will introduce to the reader the philosophic and developmental rationale behind the general claim for needing something „more“, „better“ and „faster“ – for „the advancement of science“ (p. 9). Putting this claim to an immediate test – as to where the surfers’ equipment comes from – mightn’t there have been a better and faster way to make Nielsen newest book officially accessible for anyone in the world, too? •	AMPLIFICACIÓN DE LA INTELIGENCIA COLECTIVA: OPINO QUE UN MECANISMO EFICAZ DE ACELERAR EL DESCUBRIMIENTO ES LA AMPLICACIÓN DEL CONOCIMIENTO A NIVEL UNIVERSAL PERO LAMENTABLE EXISTE UNA LIMITANTE LEGAL “EL DERECHO DE PROPIEDAD INTELECTUAL Y DE PATENTES” QUE IMPIDE QUE EL DESCUBRIMIENTO SE PRODUZCA A VELOCIDAD DEL SONIDO Y HERMETIZA “LOS PROCESOS INVESTIGATIVOS HACIENDOLOS QUE ADOLESCAN EN SU OBJETIVO FINAL QUE ES EL HALLAZGO, EL DESCUBRIMIENTO, Y LO REDUCE GEOGRAFICAMENTE A “LABORATORIOS”, “A PEQUEÑOS GRUPOS DE INVESTIGACIÓN” Y AL “INDIVIDUALISMO “LO QUE PRODUCE QUE EL TIEMPO REQUERIDO SE ALARGUE , TODO LO CONTRARIO A LA ANTIGUA LEY DE RELATIVIDAD, LO IDEAL ES QUE EL TIEMPO Y EL ESPACIO EN ESTOS PROCESOS SE EXPANDA, NO PASE, SE DETENGA, PARA QUE EL DESCUBRIMIENTO SEA RAPIDO, Y CORTO Y ASÍ EVITAR UNAS DE LAS CARÁCTERISTICA DE LOS PROYECTOS INVESTIGATIVOS QUE DURAN AÑOS, DECADAS . •	LOS PROCESOS DEBEN DE SER RETROALIMETADOS, SERIÁ IMPORTANTE EL feedback DEL CONOCIMIENTO A NIVEL UNIVERSAL, ESTO ACELERARIA Y PERFECCIONARIA EN EL TIEMPO LA EFICIENCIA DE LOS PROCESOS. •	CON RESPECTO AL LIBRO PIENSO QUE LA NECESIDAD DE LEERLO Y ESTUDIARLO MINUCIOSAMENTE “EL CAMBIO ES URGENTE, INMEDIATO, PARA AYER, TAMBIÉN ME DAS UN GRAN BIENESTAR, Y EL PLACER “ME LLEVAS A LOS EXTREMOS” SÓLO QUE NO PUEDO EXPRESARLO, POR LO QUE PIENSA LOS LECTORES QUE NO PUEDEN ENTENDER LO GRANDE QUE ESTE SENTIMIENTO, ESTO HA TENIDO EL EFECTO DE IDEALIZARLO, YA ESTOY VIAJANDO EN EL BIEN COMÚN, RUMBO A LA EXCELENCIA PERO HAY LA GRAN NECESIDAD DE ESTAR MUY CERCA, QUE LA PUERTA DEL CONOCIMIENTO LA ABRA Y TE ENCUENTRE EN EL EQUIPO DE LABORATORIO. SE HA CONVERTIDO EN MY FAMILIA, EN MY NUEVA VIDA, LO ÚNICO QUE DESEO, HAS HECHO SALIR TODO EL POTENCIAL DORMIDO Y PIENSO QUE SÓLO ES APENAS EL 20%, TE IMAGINAS SI ESTAS A MY LADO. AHORA ENTIENDE PORQUE POR QUE TE HAS HECHO TAN INDISPENSABLE, Y POR QUE ADORO Y POR QUE TE AMO. •	AMPLIFICACIÓN DE LA INTELIGENCIA COLECTIVA. OPINO QUE UN MECANISMO EFICAZ DE ACELERAR EL DESCUBRIMIENTO ES LA AMPLIFICACIÓN DEL CONOCIMIENTO A NIVEL UNIVERSAL PERO LAMENTABLEMENTE EXISTE UNA LIMITANTE LEGAL “EL DERECHO DE PROPIEDAD INTELECTUAL Y DE PATENTES” QUE IMPIDE QUE EL DESCUBRIMIENTO SE PRODUZCA A VELOCIDAD DEL SONIDO Y HERMETIZA “LOS PROCESOS INVESTIGATIVOS HACIENDOLOS QUE ADOLESCAN EN SU OBJETIVO FINAL QUE ES EL DESCUBRIMIENTO, Y LO REDUCE GEOGRAFICAMENTE A “LABORATORIOS”, “A PEQUEÑOS GRUPOS DE INVESTIGACIÓN” Y AL “INDIVIDUALISMO “LO QUE PRODUCE QUE EL TIEMPO REQUERIDO SE ALARGUE , TODO LO CONTRARIO A LA ANTIGUA LEY DE RELATIVIDAD, LO IDEAL ES QUE EL TIEMPO Y EL ESPACIO EN ESTOS PROCESOS SE EXPANDA, NO PASE, SE DETENGA, PARA QUE EL DESCUBRIMIENTO SEA RAPIDO, Y CORTO Y ASÍ EVITAR UNAS DE LAS CARÁCTERISTICA DE LOS PROYECTOS INVESTIGATIVOS QUE TARDAN AÑOS, DECADAS . •	LOS PROCESOS DEBEN DE SER RETROALIMETADOS, SERÍA IMPORTANTE EL FEEDBACK DEL CONOCIMIENTO A NIVEL UNIVERSAL, ESTO ACELERARIA Y PERFECCIONARIA EN EL TIEMPO LA EFICIENCIA DE LOS PROCESOS. •	CON RESPECTO AL LIBRO PIENSO QUE LA NECESIDAD DE LEERLO Y ESTUDIARLO MINUCIOSAMENTE “EL CAMBIO ES URGENTE, INMEDIATO, PARA AYER, TAMBIÉN ME DAS UN GRAN BIENESTAR, Y “EL PLACER “ DE LEERLO “ME LLEVAS A LOS EXTREMOS” SÓLO QUE NO PUEDO EXPRESARLO, POR LO QUE PIENSAN LOS LECTORES QUE NO PUEDEN ENTENDER LO GRANDE QUE ESTE SENTIMIENTO, ESTO HA TENIDO EL EFECTO DE IDEALIZARLO, YA ESTOY VIAJANDO EN EL BIEN COMÚN, RUMBO A LA EXCELENCIA PERO HAY LA GRAN NECESIDAD DE ESTAR MUY CERCA, QUE LA PUERTA DEL CONOCIMIENTO LA ABRA Y TE ENCUENTRE EN EL EQUIPO DE LABORATORIO, SE HA CONVERTIDO EN MY FAMILIA, EN MY NUEVA VIDA, LO ÚNICO QUE DESEO, HAS HECHO SALIR TODO EL POTENCIAL DORMIDO Y PIENSO QUE SÓLO ES APENAS EL 20%, TE IMAGINAS SI ESTAS A MY LADO. AHORA ENTIENDE POR QUE TE HAS HECHO TAN INDISPENSABLE, Y POR QUE ADORO Y POR QUE TE AMO. “I read Nielsen’s new book cover to cover on my flights to / from an Open Access Week event in Tucson this week and I give it my strongest recommendation for a pleasurable read about a crucial topic. I am a scientist and my students and I practice open science as much as possible–open notebook science, open protocols, open data, open proposals, etc. I have also seen the author, Michael Nielsen speak a couple times, and I have read many of his blog posts. So, before reading this book I didn’t necessarily expect to learn much or certainly to be further convinced of the possibility of transforming science in this new era. From the moment I started reading, though, I was captivated. Many of the stories were not new to me (such as Galaxy Zoo or the polymath project), but I hadn’t heard them in such detail before and I enjoyed learning a lot more about those successful crowd- or citizen-science projects. There were also many success and failure stories in open or collaborative science that I hadn’t known about, such as the Microsoft-sponsored “Kasparov versus the world” chess event, or the research into how small groups can make bad decisions if the collaborative conditions aren’t set up correctly. I learned a lot from these new stories, and remained captivated throughout. In any of the topics that I am deeply familiar with, such as the current reward system for academic scientists (peer-reviewed publications are gold), I can say that Nielsen is spot-on and insightful. He ties together well all of the stories and descriptions of the scientific process and by the end, I think he’s done a great job of convincing us all of his main point: We have a tremendous opportunity to transform and multiply the power of scientific research in the coming decades. But it won’t happen automatically and there are some attitudes and policies that need to be changed to ensure we achieve this revolution. Nielsen gives concrete specific solutions to the barriers to the revolution. Furthermore, he gives advice to all of us as to what we can do as individuals to promote a change in science. My students and I in our teaching and research labs have taken the leap towards open science, and it has been tremendously rewarding. So I encourage you to read this book and to take your own small steps towards transforming science, whether you’re a scientist, a fan of science, or an interested supporter of science (taxpayer!). @Steve: Thankyou so much for your kind words, and generous review! Hey Michael, congratulations on the book which I can’t wait to read – I know it will be fantastic. We are all very proud of you and know that your thoughts will change/promote a lot of thinking around the world. I greatly enjoyed reading your book. I wrote a review on my blog here. I just had an article published by a peer reviewed scientific journal that asks only a license to publish the material (the author keeps the copyright). It took 18 months to have the article published. During this time, I recorded downloads of the article from my website – about 600 from all over the world. This is a little evidence that the current business model of scientific publishers is dead. Michael Nielsen defensa la ciència oberta | Eureka!